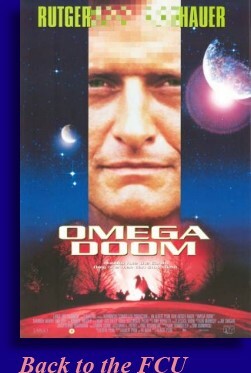 As my retrospective chronicling the works of actor Rutger Hauer continues, we have ‘Omega Doom’. So we have Rutger, who like his colleagues Tony Todd, Lance Henricksen and Nicholas Cage is an actor noted to do anything for buck, mated to legendary director Albert Pyun who is often called one of the worst film director’s on the planet earth. Not by me… I have said no such thing, but there are those who have said that. Thus armed with that information, right off the bat we could probably assume with some certainty that we have a concrete recipe for movie craptastery. But not so fast my friends… not so fast. No sir, 1996’s ‘Omega Doom’ isn’t all that great but for what we were expecting and following the last Rutger joint we saw in 1992’s ‘Wedlock’, ‘Omega Doom’ wasn’t all that bad. It’s the future… duh… and the battle rages on between man and machine. In an epic battle between one of the most brutal machines, Omega Doom (Hauer) and some dude, Omega Doom gets shot in the back of the head and becomes confused. What has happened to Omega Doom? Fast forward a bit and we see Omega Doom enter the dilapidated robot town of Buena Vista California. It’s a strange little town as we can see firsthand where super mean droid Marco (Jahi Zuri) is using The Head (Norbert Weisser) as a soccer ball. The occupants of this town see Omega and they are immediately wary of his appearance. The Head informs us that this town is run by the Droids led by Zed (Shannon Whirry) and the computer enhanced ROMS led by the ominously named ‘Blackheart’ (Tina Cote). Observe that in addition to the Warchowski brothers allegedly stealing The Matrix from that lady, they might’ve stolen the concept of The Agents form Albert Pyun and his ROMS. Just a thought. Usually the hyper aggressive droids and the evilly cunning ROMS would be killing each other, but they have relaxed for a moment because they have a common enemy, that being the humans, and the word is that the humans are nearby and ready to pounce. The robots have heard mention of a treasure trove of weapons that they could use to vanquish the humans and they are searching for them, then here comes Omega Doom who claims he knows where these weapons are located. These robots have their doubts about Omega Doom’s sincerity and all but what the hell, get the weapons and then just kill him. That is if they could kill him because Omega Doom is a quick draw artist. Don’t ask me to explain the inner working of this concept, but while these robots don’t have guns or anything they do have these odd boomerang devices in which they standoff against each other like it’s the old west or something and then draw. That’s what they do. What exactly is the plan of Omega Doom the quick draw artist? Blackheart knows the plan and she will be damned if she allows this so-called robot to execute this plan. But she’s just mean and not a quick draw artist. Good luck with that. True enough, if you were to argue that ‘Omega Doom’ is largely incomprehensible, inconsistent nonsense, I couldn’t mount much of an argument to counter this accusation. The movie does largely consist of a lot psychobabble, it has certain characters walking like robots, but only when they felt like it, complete with robot sounds, while others choose not to walk like robots, and it features a basic story that is sketchy on its best day. Not a lot of background information is given on most of the stuff we are watching and if there’s a person more ill equipped to being cast as the head of a vicious cabal of evil robots than the soft, shapely and comely Shannon Whirry, then I don’t who that person is. This was the mid nineties and we were more accustomed to Ms. Whirry doing other stuff with her particular skill set. Still, a couple of things do make this movie worth watching. For starters the concept behind the ROMS, all dressed in black, all mega cool, all wearing dark sunglasses, all speed and possessing no remorse was damned intriguing. Despite the fact she was completely covered up behind a heavy coat, sunglasses and a wig, Tina Cote was still very attractive and even more lethally intimidating as Blackheart. Again, these were The Matrix Agents years before The Matrix ever hit the screen. Then there was Rutger Hauer who seemed actually engaged in this particular film. We all know that at times Mr. Hauer can seem aloof in these throwaway movies, often appearing to just go through the motions until they cut the check, but he seemed to get into the part of Omega Doom the quick draw artist. Mister Pyun makes the most of his limited, dilapidated sets that he’s working with and sometimes some of the dialog actually made sense. I know it’s fashionable to trash Albert Pyun, but we like the guy and we’d like to give credit where credit is due and to that, ‘Omega Doom’ wasn’t all that bad. Now with that being said, two of the worst movies ever made, the ‘Captain America’ abomination and Steven Seagal’s ‘Ticker’, both helmed by Mr. Pyun, are getting reworked ‘Director’s Cuts’. Now I like the guy and all, but I don’t think I like him so much to go back and revisit those. That I can’t do.